Have you ever committed an error when typing your address into an online form? A small typo here or there may sound like a minor issue, but the cost of mailing packages to the wrong address can wipe out an e-commerce company's profits. Imagine this: You're a large online retailer that ships one million packages a year, each of which costs $5 to ship. You're in a low margin business, so managing shipping costs is very important to your bottomline. 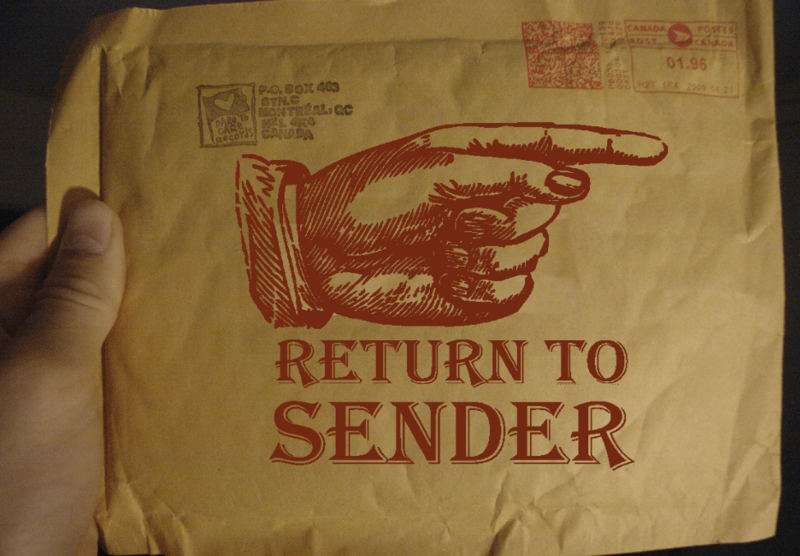 Let's say a customer types in his address incorrectly, you send the package, and it bounces back to you. Like most reputable large-scale retailers, you cover the cost of re-sending the package -- even if the error in question was your a result of your customer incorrectly filling out his data. If this happened once or twice, it wouldn't be a big deal -- but when you're moving millions of packages, the impact of mailing errors can be tremendous. According to EasyPost data, 4.7% of the time a customer fills out an e-commerce form, he or she makes an error. For the retailer shipping a million packages a year, that's 47,000 errors made on shipping forms -- or, holding true to our scenario above, $5 to reship, nearly a quarter of a million dollars in lost profit per year! And that's before considering the labor and shipping costs involved with rectifying the issue, and the strain added to customer relationships. Luckily, address verification software (a service the EasyPost API provides) can catch and automatically rectify many of these errors before packages are sent out. Retailers large and small spends millions of dollars each year shipping to unverified addresses. While address verification can help eliminate a lot of these errors, mistakes still get made -- and when they do, and packages bounce back, companies are usually left to pay the postage. We pay something like $150-$200 per month [in postage fees], sometimes twice that, for packages that get returned to for being undeliverable, one small business customer tells us. We also cancel probably a handful of orders per week for having bad addresses that we can't get verified. To be fair, not all of these errors are typos on the consumer's end. Whether or not an address is "verifiable" depends on its inclusion in the carrier's database; while these databases are incredibly deep, there are more than 120 million homes in the U.S. and it's simply impossible for a carrier to include them all. The USPS database is updated once per year, and it is the job of local postmasters to report any address changes or additions that have occurred in their jurisdictions. UPS and FedEx each have their own methodologies for keeping up-to-date address banks, both of which are more centered around residential and commercial division, since these companies factor shipping costs differently based on each category. In the case of all carriers, documenting every address -- especially those in very rural areas -- is an incredibly challenging task. Like many residents of rural McDowell County, West Virginia, his house had no number, and his street had no name. The postman doesn't deliver there...directions are proffered in paragraphs; landmarks ('the stone church,' 'the old sewing factory,' 'the dumpster painted like a cow') function as de facto street signs. 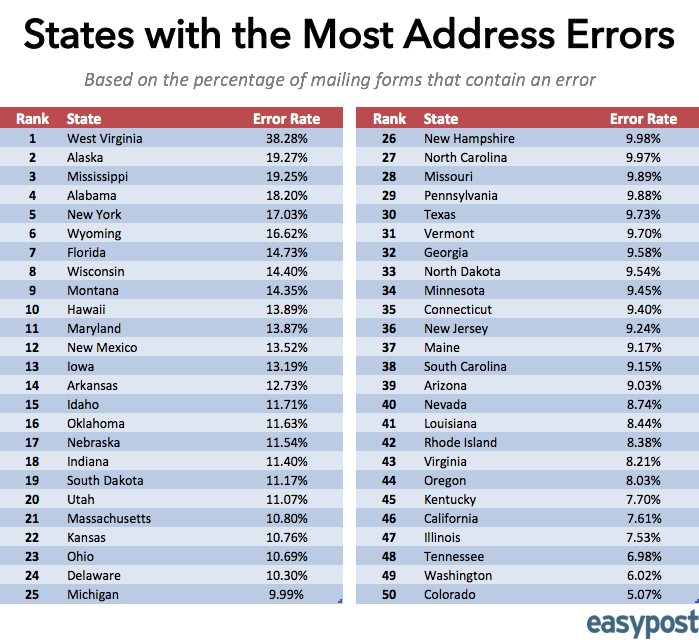 Many other top states on this list -- Alaska, Mississippi, and Alabama -- also have populations that are more than 95% rural, where many houses are not included in carriers' databases. Admittedly though, isolation isn't the sole factor that influences error rates on e-commerce shipping forms. 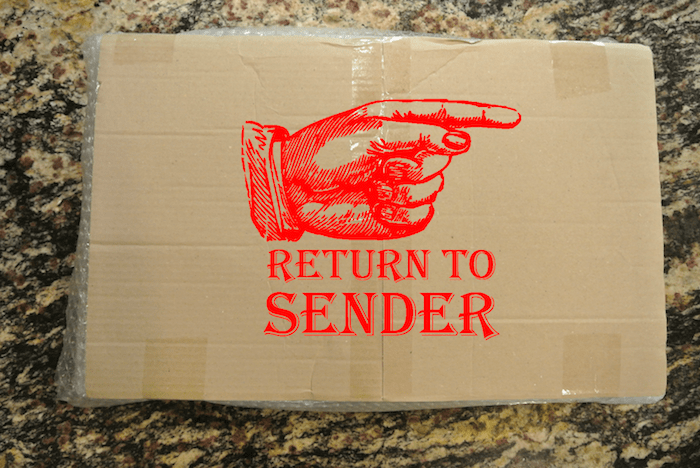 In the event of a bounced package, these mailing errors amount to a much bigger cost for a company than merely the price of the box and postage. Factoring for lost customer relationships, increased labor costs, and reduced cash flow, numerous studies have determined the cost of rectifying a shipping error to be between $35 to $70, depending on the size of the shipment. Fortunately, address verification software has increasingly been integrated into most online retailer's platforms to minimize these costs. 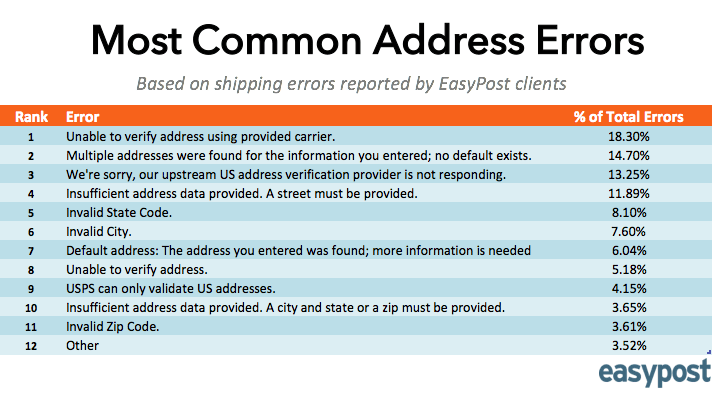 Using a number of address databases and data sources the EasyPost API corrects addresses entered by customers. Through use of the EasyPost API, a company can ensure that USPS (and other carriers) can find an address before buying a shipping label and risking the dreaded Return to Sender stamp on undeliverable packages. It also allows for the integration of USPS, UPS, DHL and FedEx shipping APIs into any application in minutes. So what's the downside of address verification? 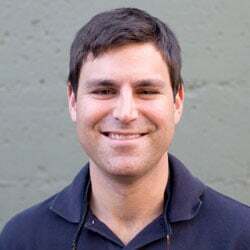 It potentially adds another step to the checkout process, and that extra friction could lower conversion rates. But even considering this, without verification you risk having to reship packages 4.7% of the time. That's an enormous cost that many merchants never consider until it starts happening to them. Unless you use address verification, your customers are going to make a lot of mistakes when they fill out their addresses. 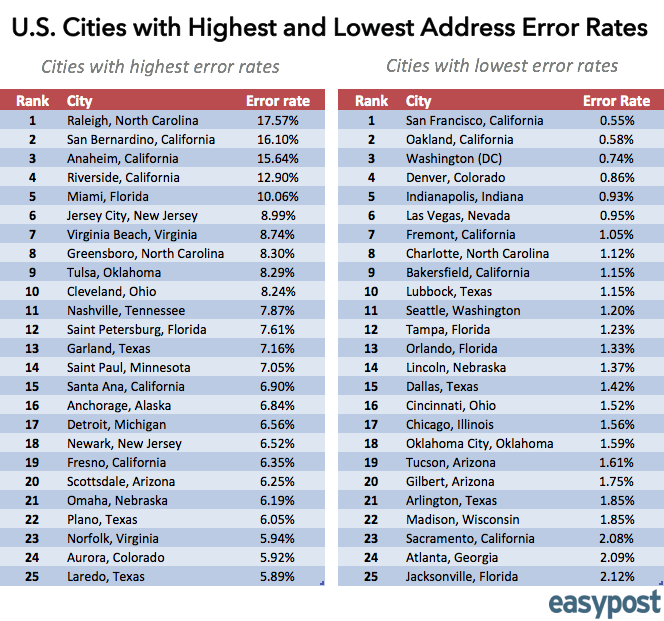 Humans make errors, but in the case of addresses it doesn't have to cost you more in shipping.